It was on this day that I finally set foot in Maine for the first time. It had been 17 months, or roughly 525 days since I began the journey on Springer Mountain, Georgia. A couple of other hikers were at the sign that marks the Maine border when I arrived, enjoying a leisurely lunch break. 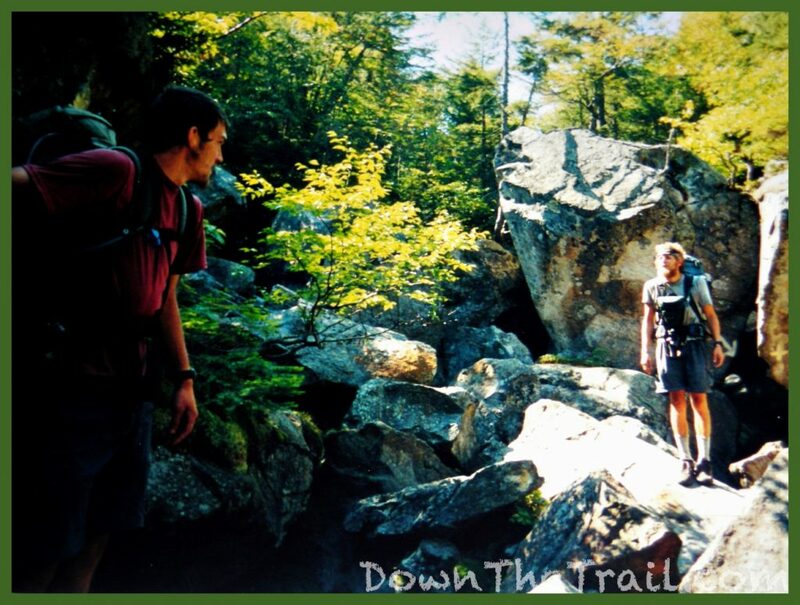 They were a couple in their twenties, and their trail names were Homie and Honey. 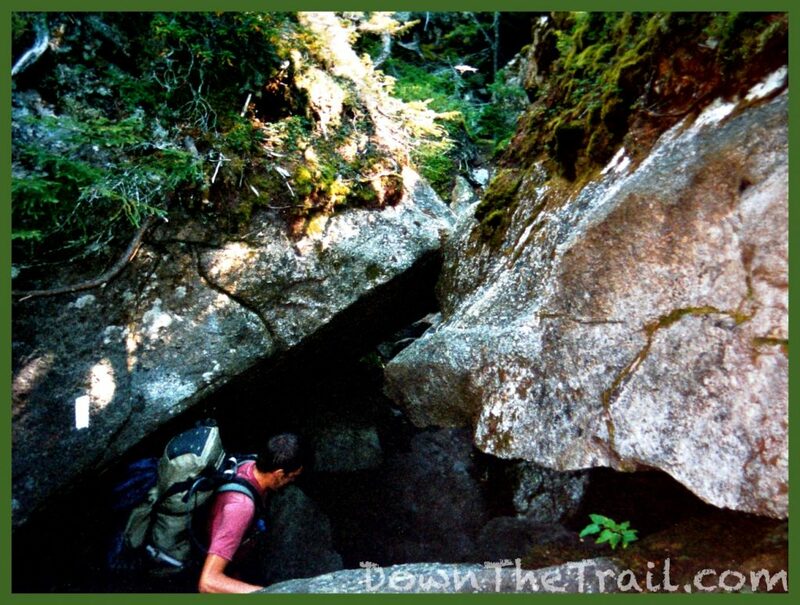 The trail in Maine was immediately beautiful and rugged. This was a windy day – the straps from my pack whipped through the air and often smacked me in the face, but otherwise I found the wind to be invigorating. There was talk in some of the shelter registers that some hikers had already begun to see moose at the ponds and lakes, usually in the early mornings. 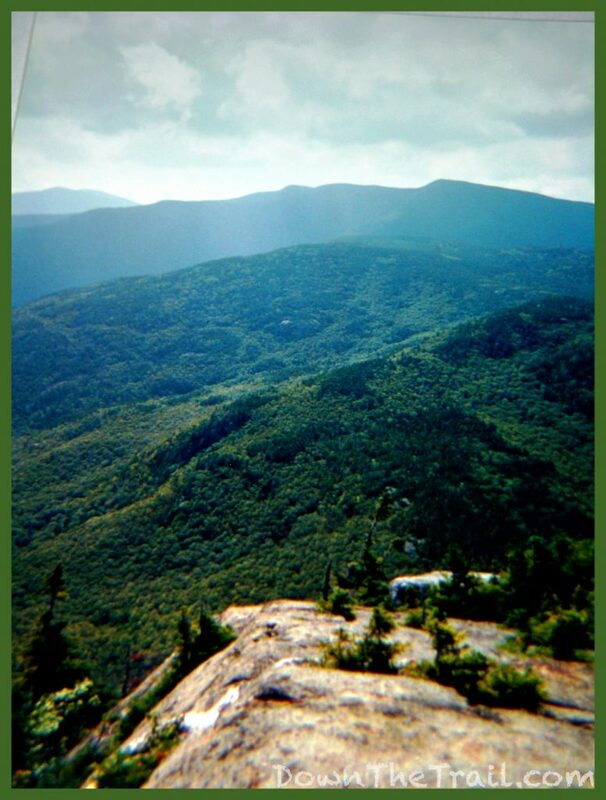 I would not see a single moose on the Appalachian Trail in 2002. I took a zero day here at the Full Goose Shelter because I felt absolutely awful. A couple of hikers back at The Barn hostel in Gorham were stuck there with a cold or flu, and I guess I caught it. I spent the whole day in the shelter, mostly in my sleeping bag. I slept as much as I could. I’m certain that I had a fever, but of course there was no way to check without a thermometer. My friends caught up with me here, namely Hollywood and SoFar. It lifted my spirits to see them. I remember that Hollywood was happy to see that the denatured alcohol stove was working out for me. Just around the corner from here, about a mile north up the trail, was the infamous “Mahoosuc Notch.” The notch is a narrow ravine filled with huge boulders, and it holds a reputation as being the most difficult single mile on the entire Appalachian Trail. We planned to stick together the following day and tackle it as a team. I still felt awfully sick, but with the motivation of friends I was ready to pack up and continue north up the trail. The Mahoosuc Notch ended up being a lot of fun! 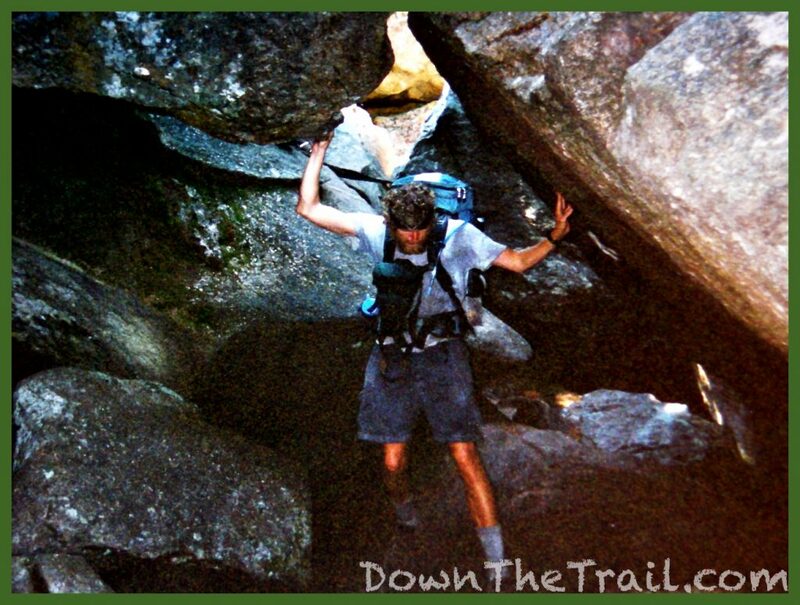 It involved scrambling up, around, and even through a mess of huge boulders. We took our time, getting lots of pictures and passing our packs to each other through the most difficult sections. The guidebook said to look for year-round ice in the shaded areas, but we never saw any. 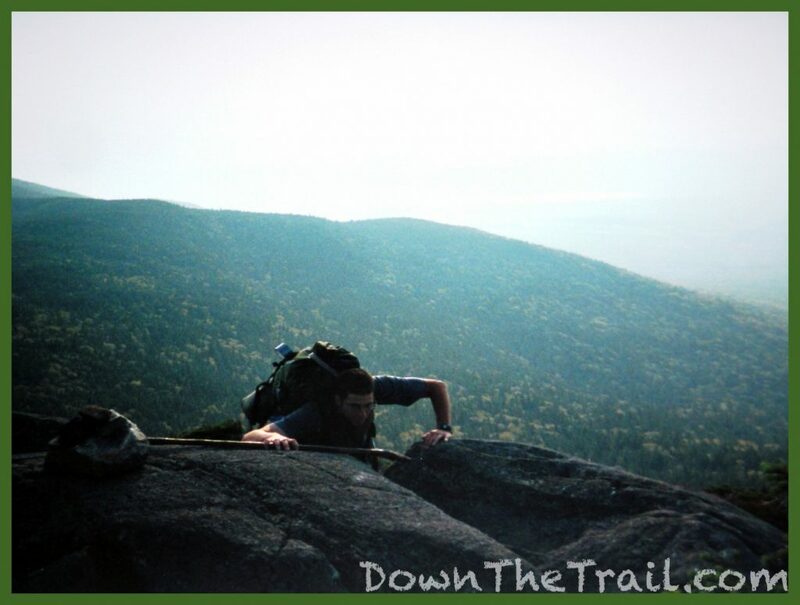 Everybody says the Notch is the hardest mile on the AT, but nobody says much about the climb up the “Mahoosuc Arm” which sits just immediately north of the Notch. It’s steep! Since I was feeling sick I had a slow and difficult time getting up it, but Hollywood and SoFar and were waiting for me at the top. Later we crossed a small meadow-like bog and went up Old Speck. This climb was a little shorter and more fun, up solid boulders with open views. SoFar and Hollywood went on ahead, and I think they were expecting me to catch them at the next shelter. There was a road crossing late in the day at Grafton Notch, and I decided I’d dive off of the Trail from there and into the town of Bethel, Maine. Bethel wasn’t a common stop for thru-hikers. The town is 17 miles down a lightly-traveled road from the Trail, but I felt like I’d never get better without a good rest in town. It was late in the day and rather chilly by the time I got to the road. In addition there was virtually no traffic on it, so I discreetly set up my tent a short distance from the pavement and spent the night alone, intending to hitchhike into town first thing in the morning. This shot is a great example of how pale and sickly I was. The bandana was for sneezing and wiping my nose. I was having a lot more fun than it looks! I caught a ride into Bethel and had a very restful and relaxing day at the Chapman Inn. I was lucky to get a room with kitchen facilities (The “hiker dorm”), so I spent the day cooking and eating over a pound of spaghetti. In addition to that I drank about a gallon of orange juice. It also happened to rain all day long, so it looks like I picked a great day to get sick and be off the trail. This was the first anniversary of the September 11th attacks, so television programming was dominated by programs that honored the occasion. 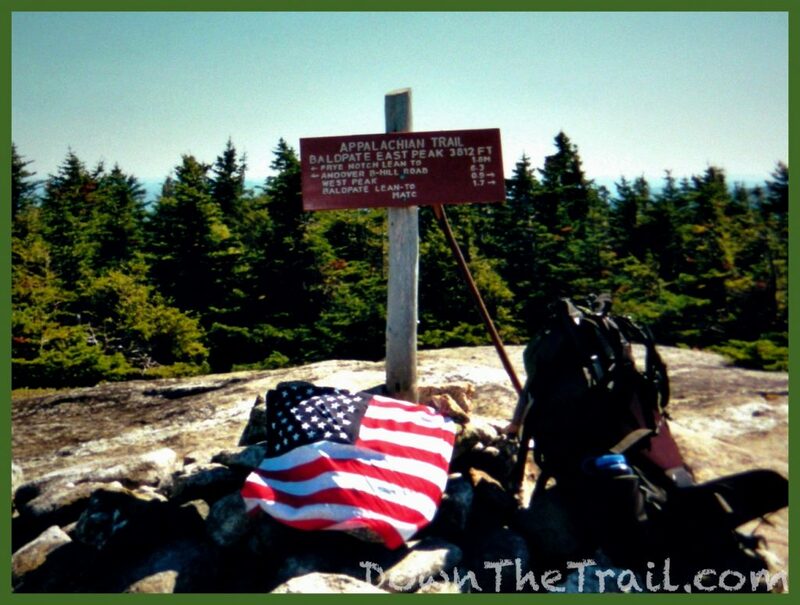 I found it ironic, and once again possibly “meant to be” that I found myself in a small town along the Appalachian Trail on this day. I was feeling significantly better in the morning after a full day of rest, and I got a ride back to the trail with the owner of the inn. He was a younger guy, probably in his early 30’s, who had just moved to this small town himself. I could tell he must not have interacted with too many hikers yet, as he was really interested in my hike, the Appalachian Trail, and generally just keen to hear what it was all about. Yesterday’s rain had washed the mountains clean, and today there were clear blue skies. I was solo and certainly still sick, but felt like I’d gotten through the worst of it. It was a sunny, beautiful day that totally lifted my spirits as I hiked over the windswept Baldplate peaks. I dove into the next town for the night in Andover, and was surprised to catch up with Hollywood and SoFar there! I think there was also some trail magic involved in getting a ride to town in the first place. My memory isn’t clear on this, but I think that Big Red may have been involved. 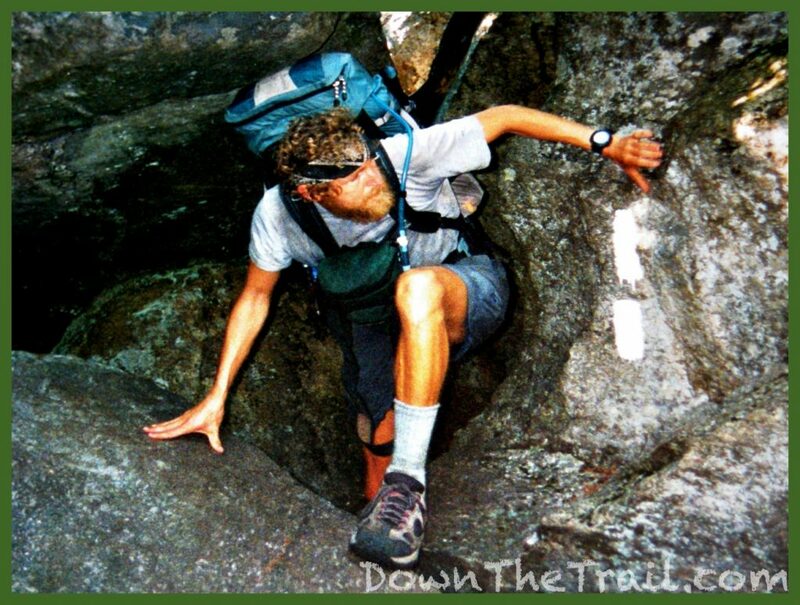 Big Red was a thru-hiker in 2002 who started the Trail with the primary goal of losing weight. I think it was somewhere in the mid-Atlantic states where he decided to go home and grab his vehicle to use as support. 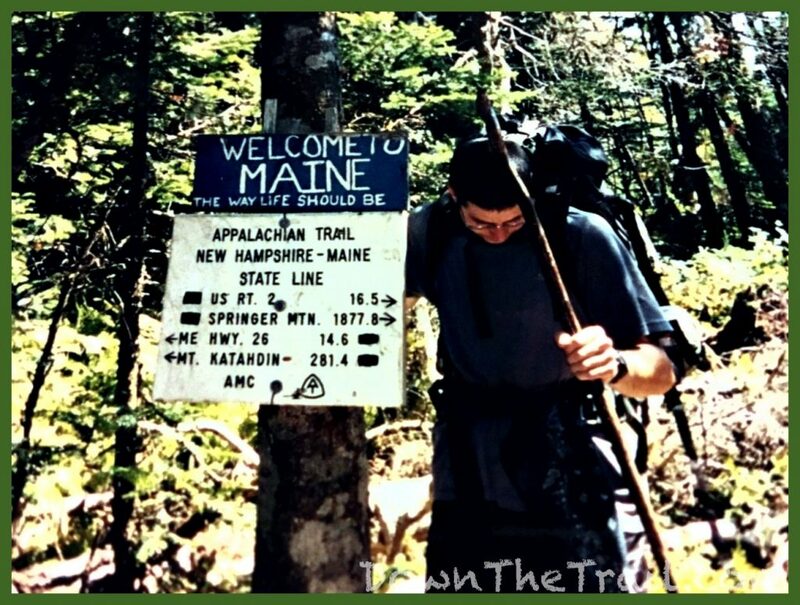 He finished the remainder of Appalachian Trail as a series of day hikes, staying in town for the night as much as he could. 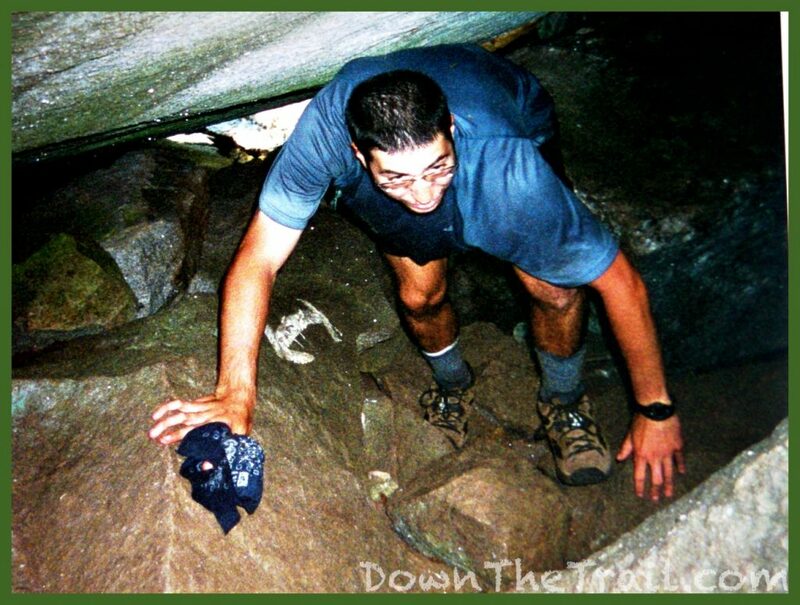 Regardless of exactly how I got to Andover, I remember that it was in a vehicle with a few 2002 thru-hikers that I met for the first time. 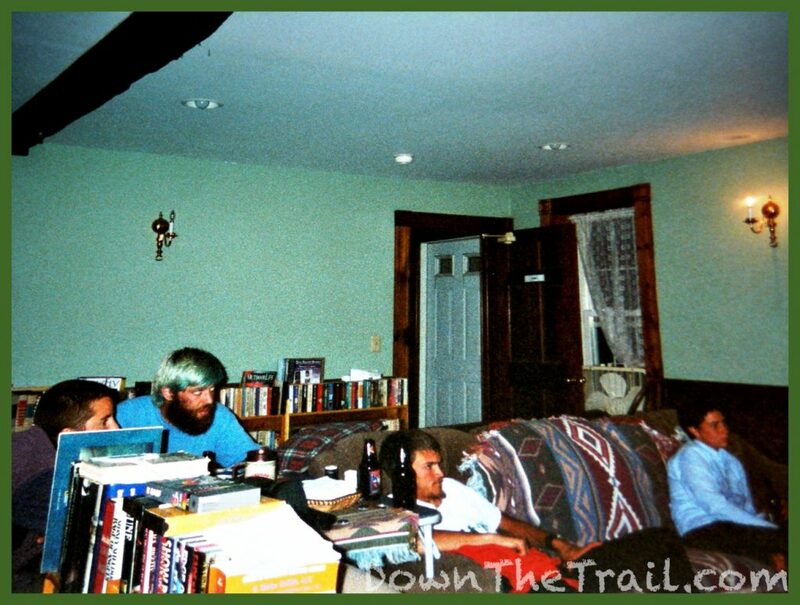 I want to say that one of them was “Girl Next Door.” They were staying at a hostel called The Cabin (I’d met the owners of The Cabin after Trail Days in 2001). The hikers had heard of me and said that Hollywood and SoFar were waiting for me at the Andover Guest House. It felt great to know that they’d been wondering about me. I guess I wasn’t too clear in communicating to the guys that I was going off the trail the other day and into Bethel, so I think that they were even mildly concerned about me. The heavy rain yesterday was a great reason for them to take a day off in my absence, too. It was a fun night at the hostel. The owners allowed us to drink alcohol in the common area, so everyone had picked up some beer from the local stores. I think they had some music and/or a TV with movies for our entertainment – these small things are quite a luxury after you’ve been on the trail for a while. I love reading your journal! Its like reading a good book I can’t put down. I love it! Your detail makes me feel like I’m right there. You did something many people can only dream about. 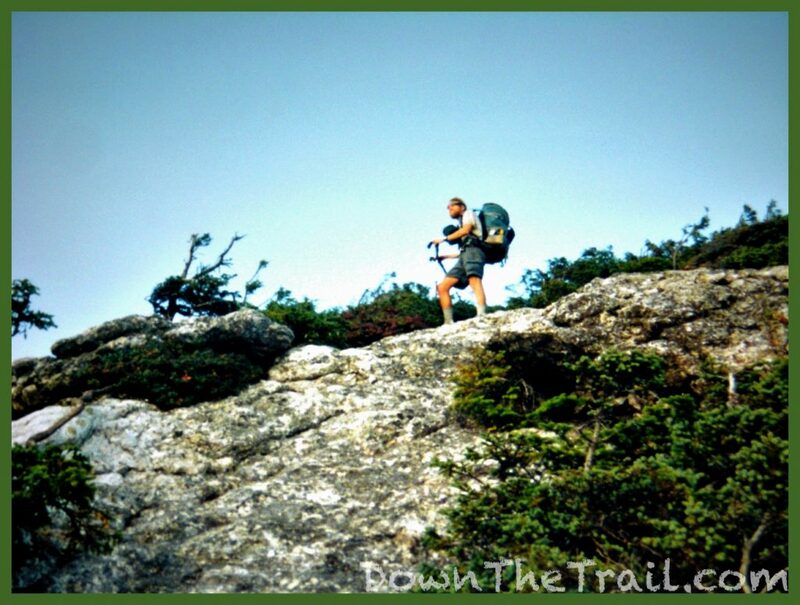 There are so many people that would love to hike that beautiful spectacular trail. Living with nature is so healing and so good for the mind,body and soul…and you wrote it all down perfectly! Thank you so much for sharing your adventure with us. I am enjoying it very much. Reading it takes me into a world I would love to experience in real life but I can’t for many reasons but your journal is the next best thing. I feel so god when I read it! Thank you and peace, love, and blessings!